Nigeria’s Chief of Army Staff (COAS), General Tukur Buratai, and his two wives are joint owners of a Dubai property that was paid for in one transaction. Investigations by SaharaReporters indicated that the money for the purchase of the property may have come from a vehicle contract scam while Mr. Buratai was the Director of Procurement at the Army HQ. Our correspondents discovered that the Nigerian Army had awarded an apparently bogus contract for the supply of vehicles and motorcycles for the use of troops involved in an anti-terrorism offensive in Nigeria’s beleaguered northeastern zone. The allegation that General Buratai might have pilfered funds meant for the purchase of military vehicles has sparked outrage among soldiers and officers, especially those from the northeast part of the country. Two military sources disclosed that irate officers had petitioned President Muhammadu Buhari, urging him to order an investigation into the contract scam. In the petition, exclusively obtained by SaharaReporters, the aggrieved soldiers and officers, under the umbrella of Concerned Soldiers and Officers From the North East, accused the COAS of executing the contract through a proxy of his. According to the petitioners, the proxy's name is Usman Gamawa, founder of Baggash Investment Limited. The petition stated that, rather than supply new vehicles as the contract demanded, Mr. Baggash purchased second-hand vehicles and motorcycles from Niger Republic. On arrival in Nigeria, the vehicles were then refurbished at Mogadishu Cantonment under the supervision of Staff Sergeant Dadan Garba. SaharaReporters learned that some of the vehicles and motorcycles had since broken down. “If President Buhari can give service chiefs enough money to buy equipment, why are they buying old ones?” asked the petitioners, who added that General Buratai was exposing troops to grave danger and undermining the war against Boko Haram terrorists. The petitioners further claimed that, since his appointment as COAS last July, General Buratai had been making numerous hefty deposits in his various bank accounts. For example, his Skye Bank account (1770380452) received a deposit of N10 million on July 24, 2015. On August 7, 2015, another N10 million was paid into the same account. Three days later, the account was credited with yet another sum of N10 million. On August 11 and 17, N4 million and N3, 270,000 were credited to the account respectively. SaharaReporters contacted the owner of the phone number on the Skye Bank Lodgement Voucher which was found to belong to a Major Adegbola, according to TrueCaller. Mr. Adegbola confirmed to our correspondent that he was "Major Adegbola" by saying "correct" but denied knowing Mr. Buratai and later said that his name was actually Joshua. 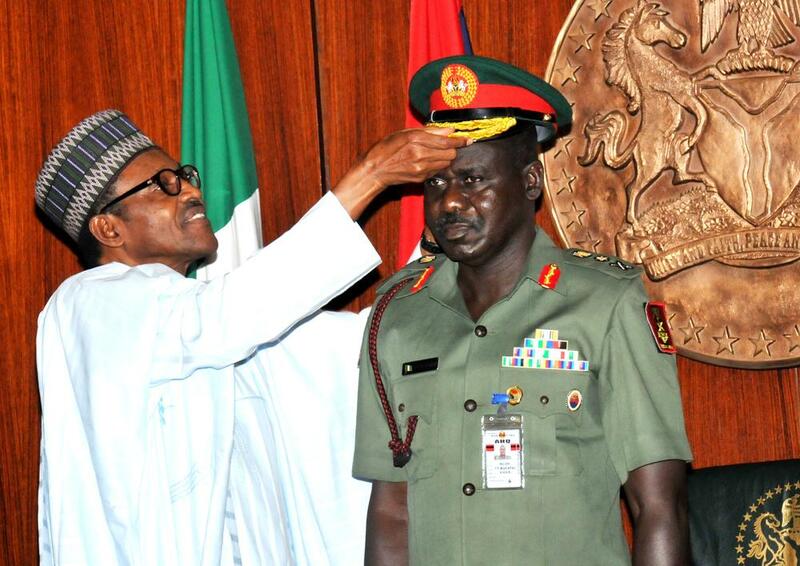 Sources speaking to SaharaReporter said that the number on the voucher was of Mr. Buratai's middleman. Contacted by our correspondent, an aide of General Buratai admitted that the general owned a house in Dubai, but denied the allegation that the COAS and his wives had purchased a home in Dubai by making a single payment. “Please know that the allegation on the Chief of Army Staff and members of his family owning a property in Dubai is an old one. It is a fact that the family bought such property through personal savings and [it] was paid for instalmentally since 2013. It may interest you to know that this petition is not new because there was [a] similar allegation in March this year, [but] it could not see the light of the day because there was no substance in it,” said the source. General Buratai’s spokesman added that some human rights organizations and well-meaning individuals confirmed that information about his property in Dubai was in the general’s assets declaration form. “The mentioned assets were always declared in his asset declaration forms as Commander MNJTF and the most recent one was when he was appointed Chief of Army Staff in July 2015,” the aide stated.